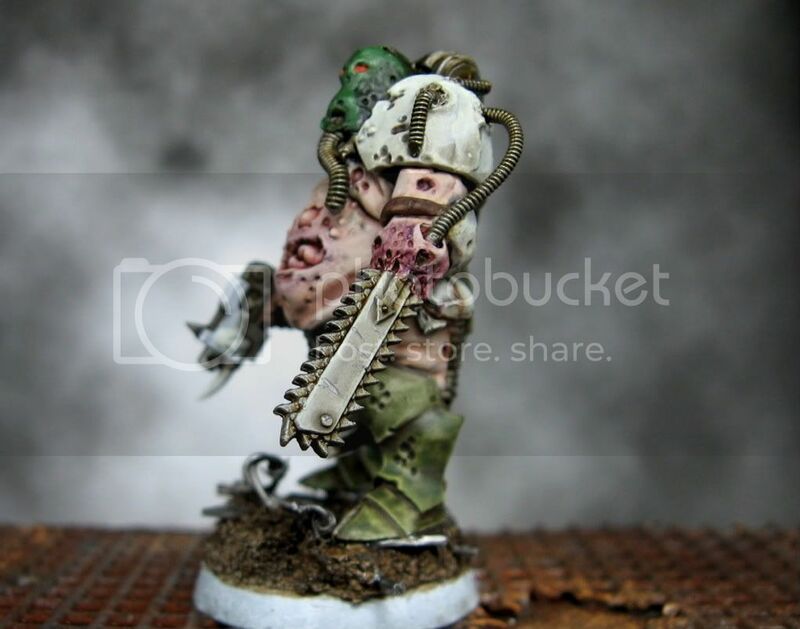 Last week I showed pictures of my conversion of the plastic Nurgle Lord into a renegade sergeant. I have him about 80% painted now and I thought I should share some work in progress pictures. If you want to see the conversion before paint, check it out here. Where I am currently at. Just the black, brown highlights, some glazes, the base, and some oozing gunk left to go. The painting has definitely been a process. 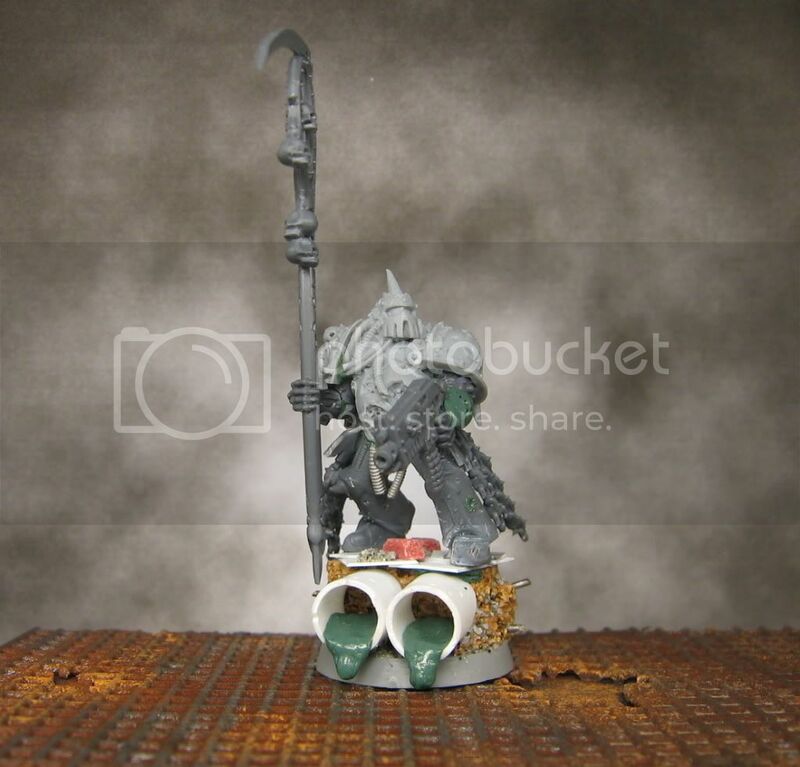 I read an interesting article recently about blending highlights and shadows basically by quickly wet blending using a slightly damp (with saliva!) brush. I've been trying it out on this model. The best example is the shadows on his leg around. I am really pleased with how it has turned out. I also used it a bit on the skin. I also experimented with using GW washes, wiping them off the brush, and the glazing the flesh on the model for bruising around the stump. The mask has been the biggest challenge though. The basecoat colour didn't look very good and my highlights just kept making it look worse. I am finally satisfied (not really happy though) with the tone it currently is at. I realize that adding a glow around the eyes will change how it looks as well. So I may still add another wash after painting the glow around the eyes. Here are some of the different iterations the mask painting went through before reaching this stage. The mask looked like this tonight before I added many washes and glazes. Too white. Before that it looked like this. I thought it looked too much like an ork. In retrospect, it wasn't so bad when viewed as a part of the whole model. It was driving me crazy though. I am hoping to get this model finished Friday evening. It has really been pushing me as a painter. These renegades have been making me try so many new techniques that (I think) are making me really improve my painting. Welcome to new followers Chris, Pete (wow, nice and easy handles this time! ), and Diehard 2501. 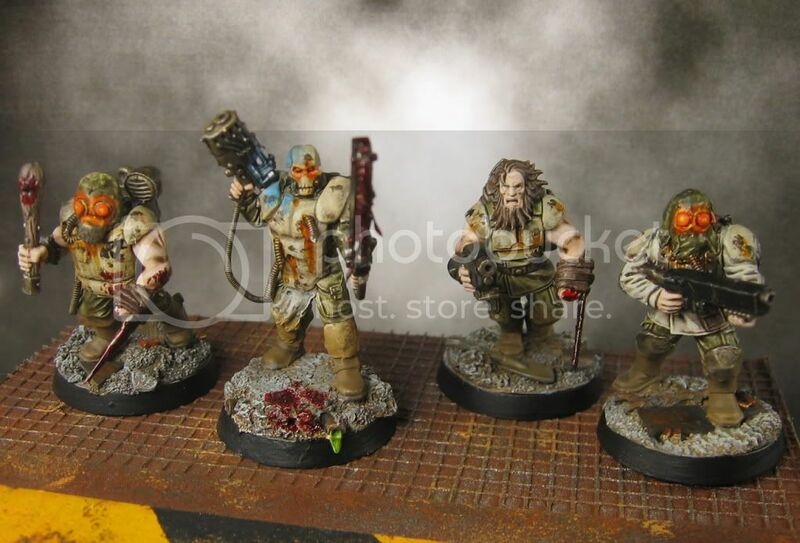 Thanks to Ricalopia (a semi-local blog) for featuring my renegades in his blog last week. I couldn't find a comment function though to thank him over there. Thanks for visiting! 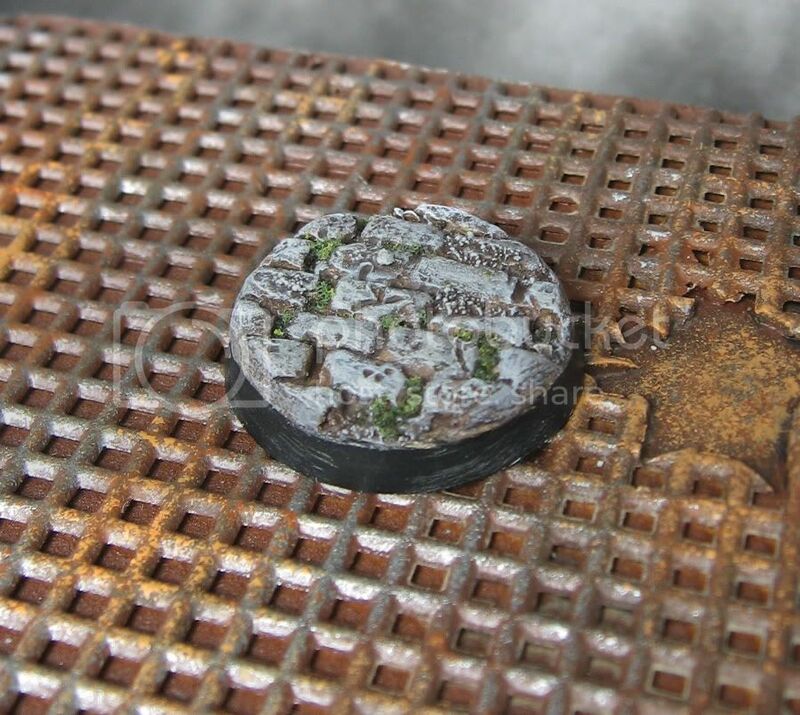 An online friend was having trouble painting chipped metal and rust on his space hulk terrain and asked me for a tutorial. This is the technique I used on a lot of my past terrain projects that I have posted here. This picture shows the final effect we will achieve using this method. I will list the materials I used here. You can substitute similar colours. The colours I used are listed in brackets. I began by spray painting the whole piece using a matte grey primer. 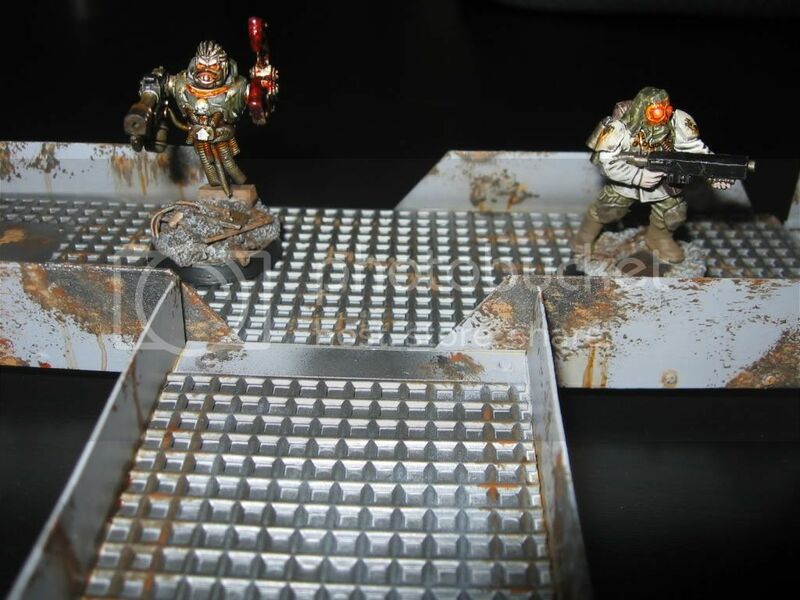 I then used my airbrush to add a little boltgun metal in the middle of the walkways to simulate wear. 1. 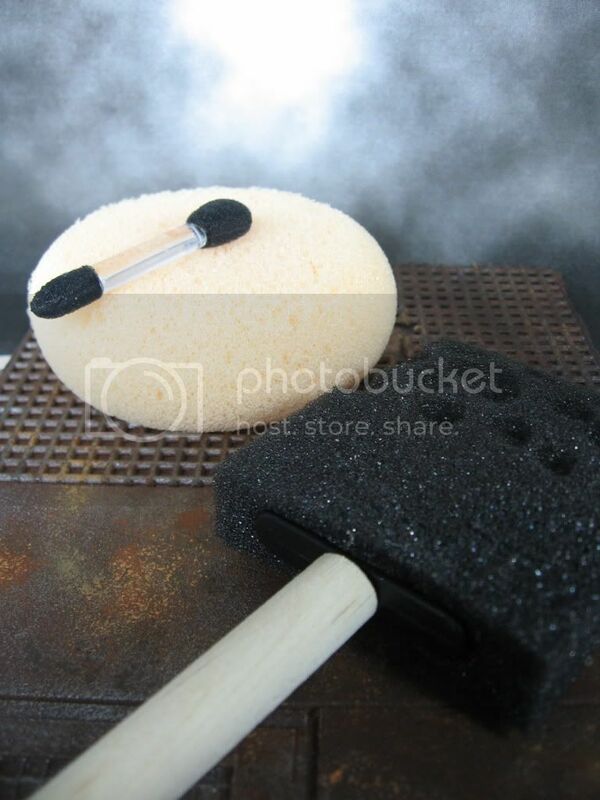 Dark brown: Use your sponge to lightly stipple the dark brown colour in the areas where you want chips and rust. Dab the sponge into the paint and then try to get most of the paint off on some scrap paper. You want the sponge to create incomplete coverage. Dab the paint onto the surfaces using the sponge. I usually aim for about 20% coverage of a surface (change this up if you want more or less damage). 2. 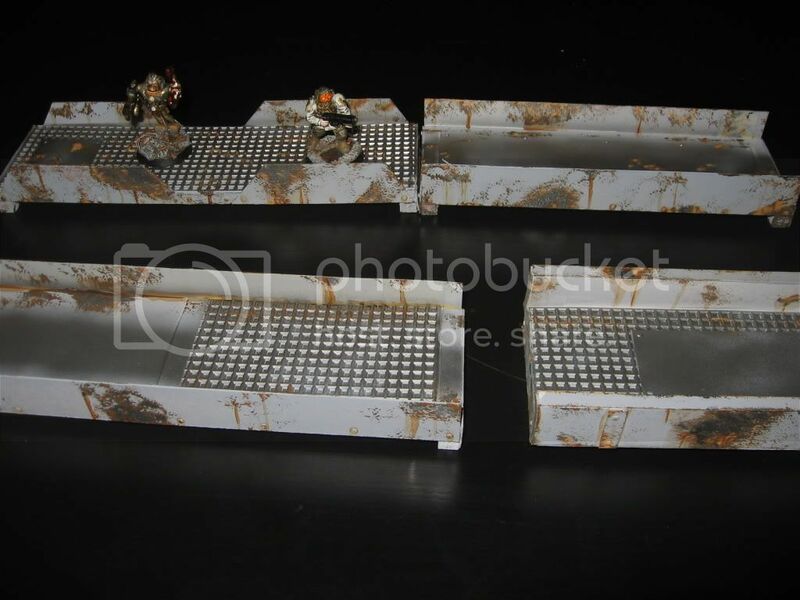 Metal: Use your metal colour to stipple metal inside the spots where you have already stippled the brown colour. 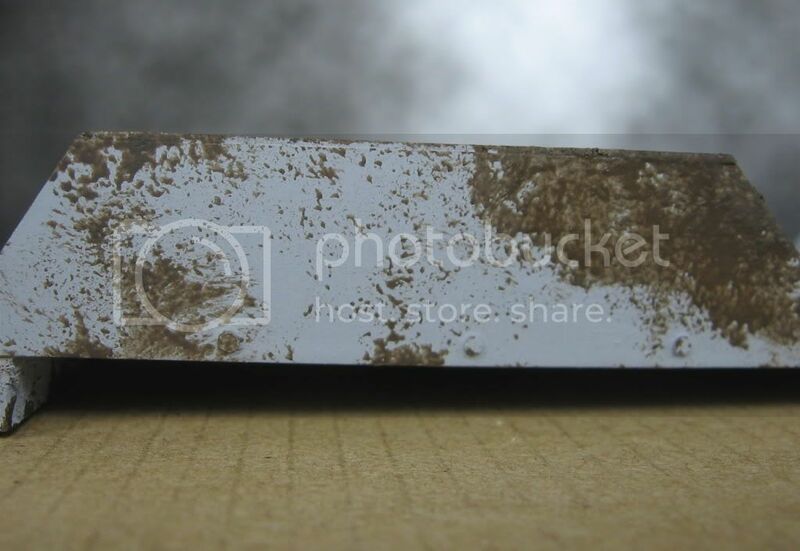 Aim to keep most of the metal inside the brown areas to create the illusion of chips and damage. Some metal outside of the brown is fine. Be sure to leave lots of brown showing through. From this step on I used the makeup applicator as it has a smaller surface, giving more control. 3. Reddish brown: Now stipple the reddish brown (I used bestial brown) into areas where you want rust. I would recommend stippling the reddish brown over the exposed dark brown areas and lightly over some of the metal bits. You only want a little bit of reddish brown. Work with only a little paint on the sponge for this step. You can always add more later. 4. Light orange-brown: Using your light orange-brown colour (vomit brown), lightly stipple your rust highlight over the reddish brown areas. Like with the reddish brown, aim for just a light dusting in key areas. This colour really stands out. You don't need much. 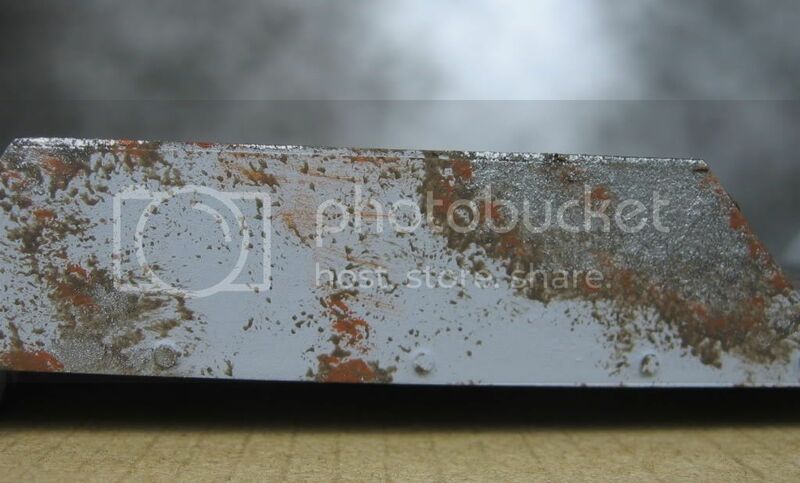 You are just trying to create the illusion of a little bit of corrosion and rust around the metal. 5. Brown wash: Now the fun part! Our rust and metal are mostly finished. 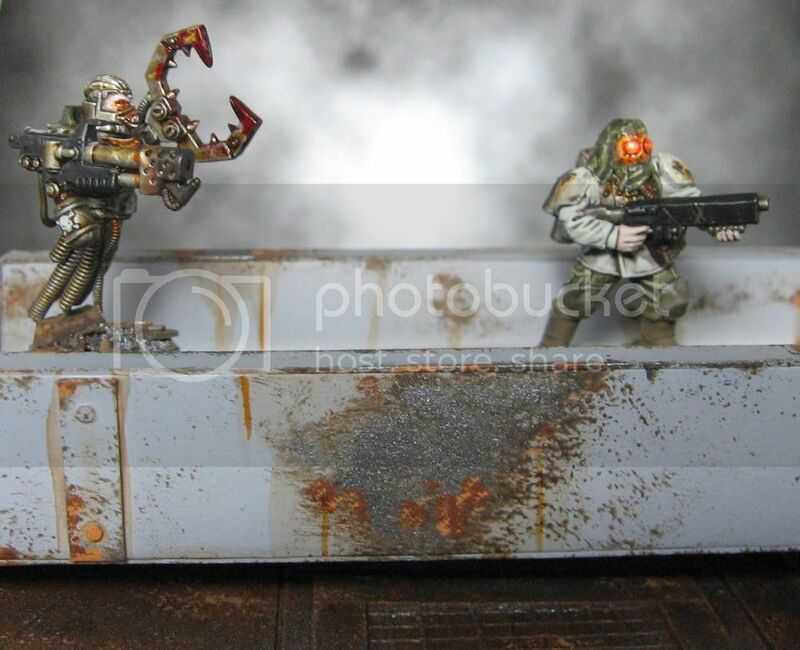 To continue the illusion we want to create the effect of water and rust runs. 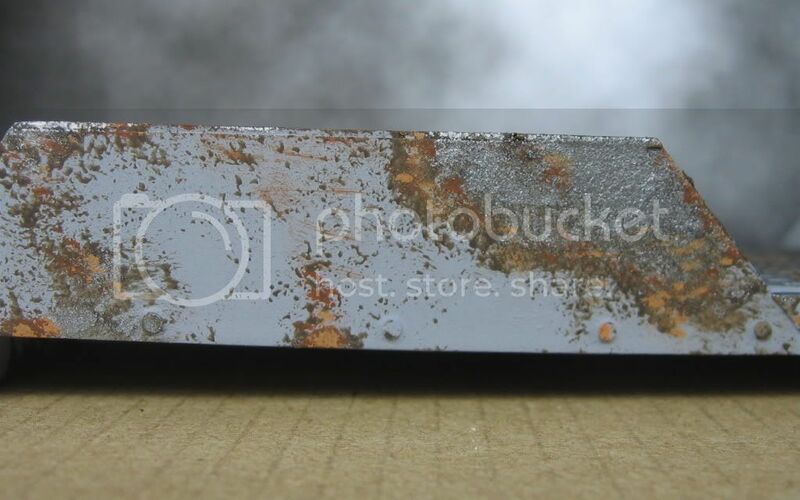 Use your wash undiluted and draw vertical lines from areas with lots of corrosion. Create a variety of patterns. Large areas where washes pool, thin runs down the side, runs starting at rust, runs around rivets, etc. Try to ensure that the lines primarily go vertically, and don't slope to the side. 6. Orange ink (optional): This step is definitely optional. I really like to make the runs "pop" by highlighting them with some Tamiya Clear Orange. A second coat of Gryphonne Sepia also works. 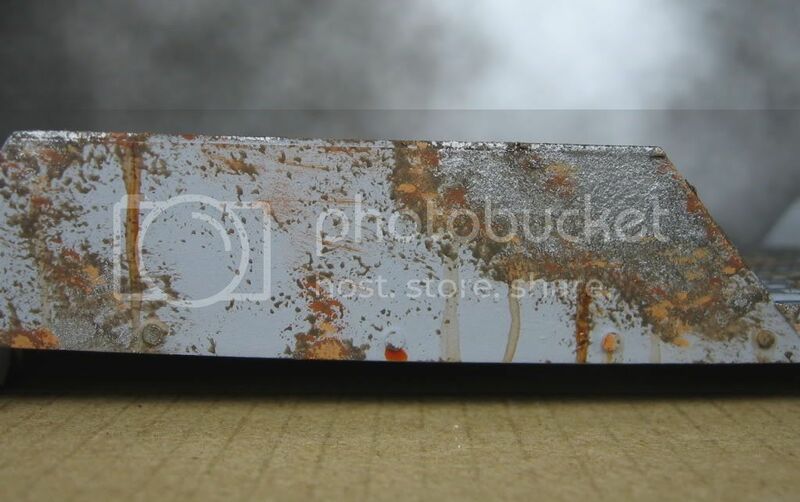 The use a detail brush and add a thin line of clear orange inside some of the rust runs. Don't overdo it. 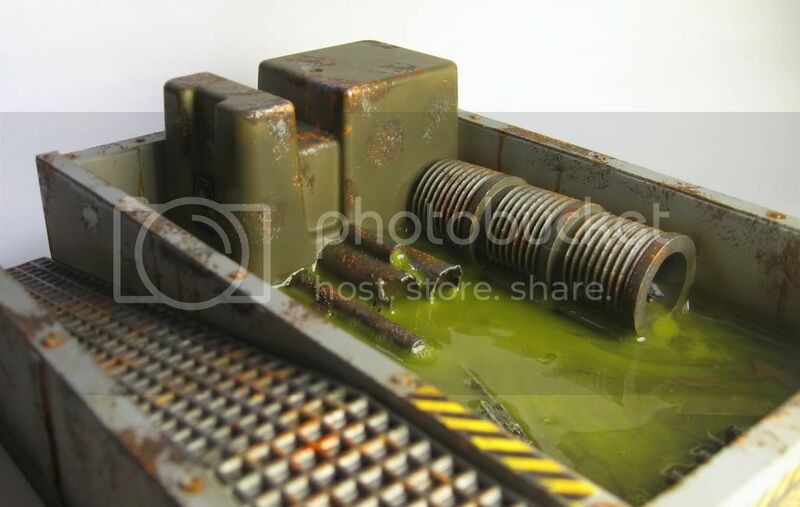 Just create a few gross and corroded areas. Then you are finished. These are the steps I use. Obviously these steps can be modified for the colours you have and the effect you want to achieve. 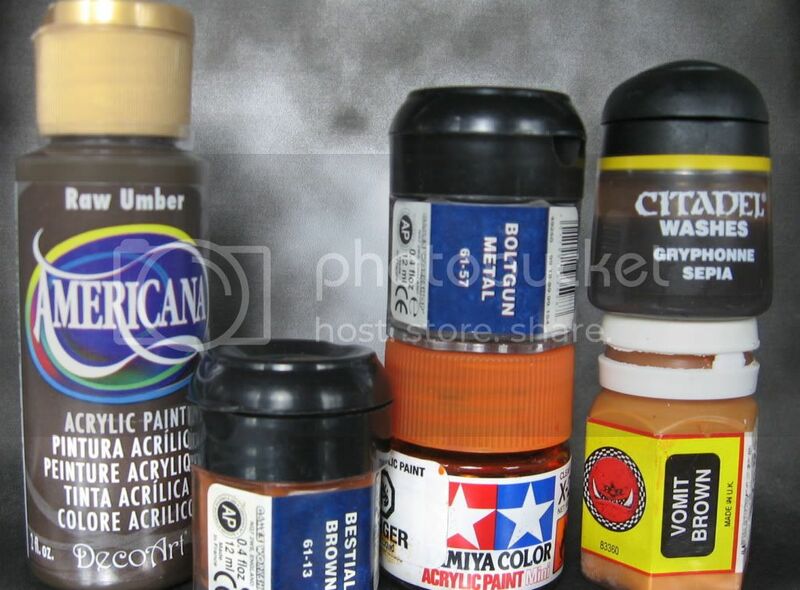 I have found this to be a quick and painless way to paint rust, corrosion, and exposed metal on larger terrain pieces. Here are the four walkways I painted up while making this tutorial. I did a similar blog outlining the steps I used on another terrain piece. The steps are pretty similar. 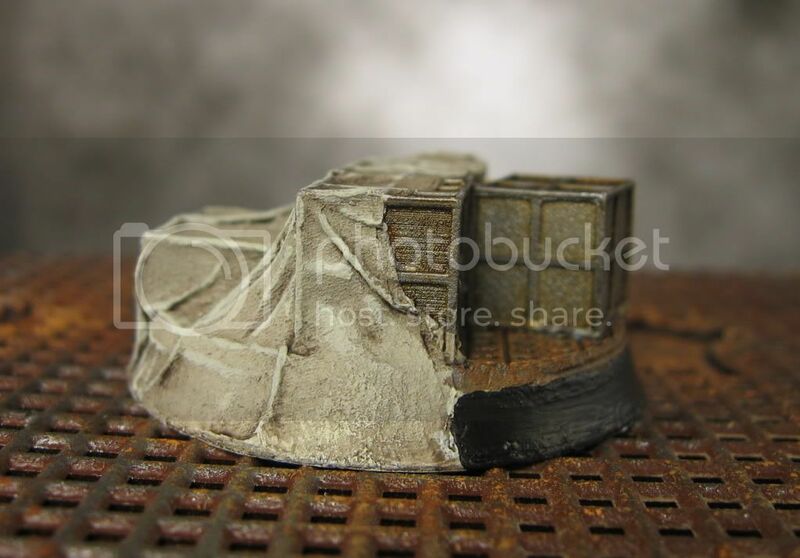 Check there if you would like to see more: Industrial weathering tutorial. Finally, welcome to Nickolai Lorenzen, the newest follower. I've added two new sections at the top; about me (in case you wanted to know more about me) and a link to all of the tutorials I have added so far. Thanks for visiting! 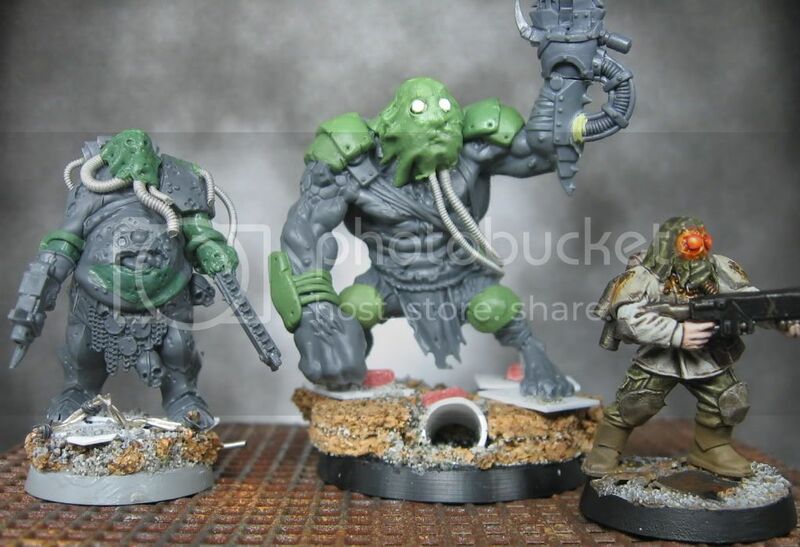 This tutorial will show you how to quickly and easily create brick bases for an army using greenstuff or any other sculpting putty. I'll show the steps for building a simple press mold to quickly make nice bases. 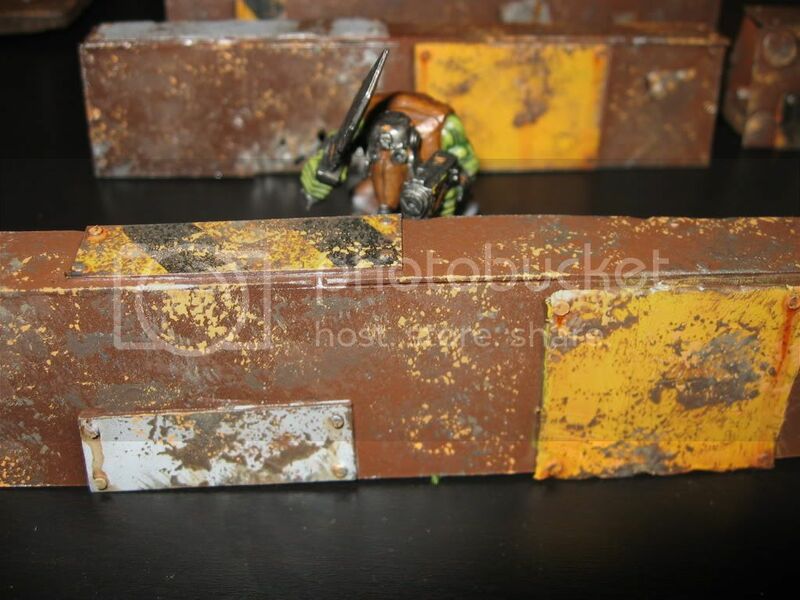 I recently saw this tutorial on building brick bases and casting to create bases. 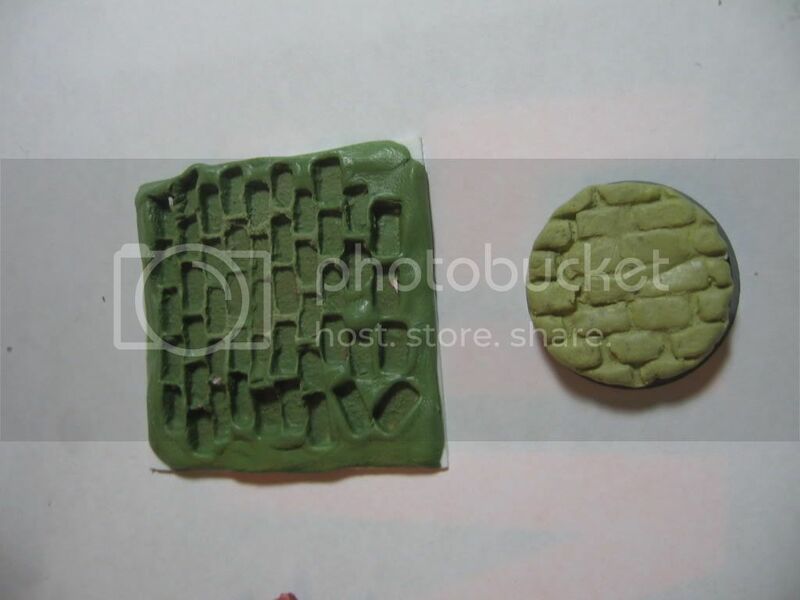 I don't currently have a casting kit or materials so I decided to try it with a press mold. 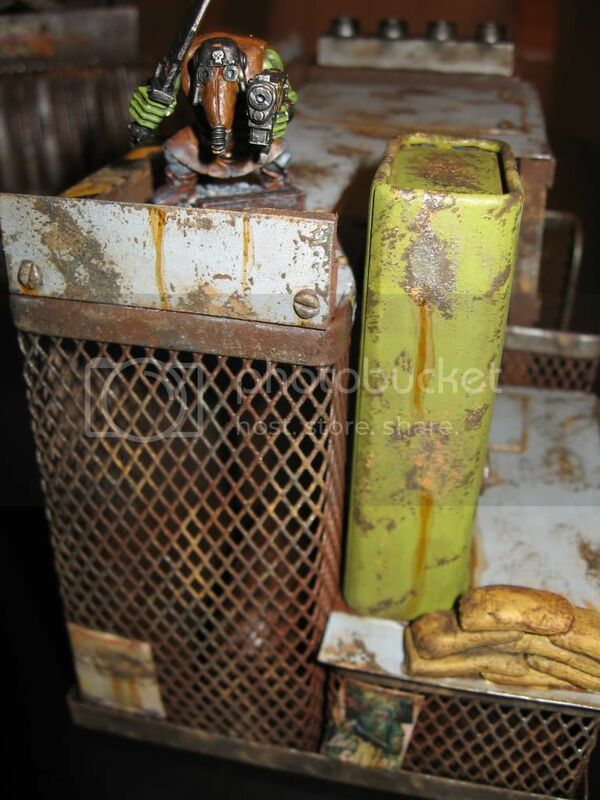 I was also inspired by these cool brick Mordheim bases at Massive Voodoo (a great website, lots of incredible stuff). 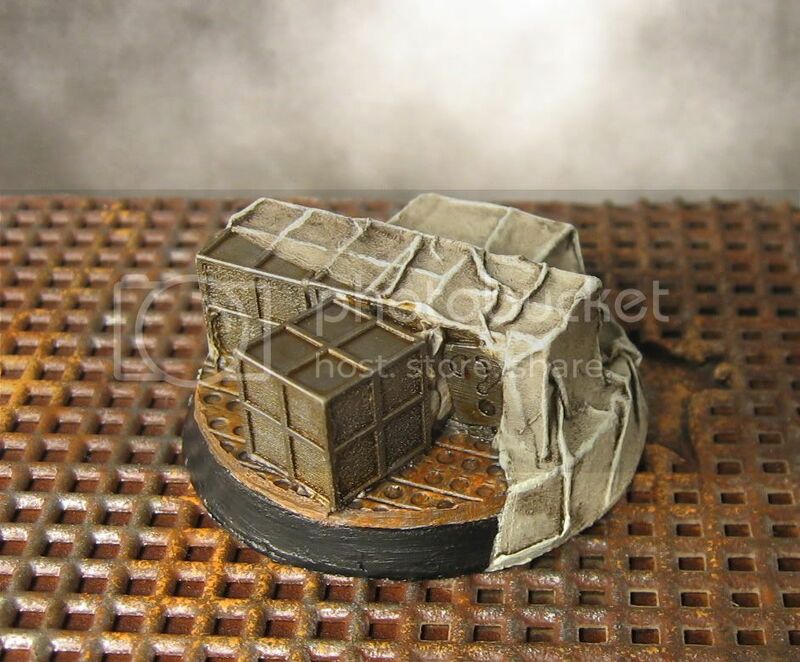 This tutorial will show you how I made a simple press mold to make lots of brick or flagstone bases for a Mordheim warband, Malifaux crew, Warhammer Fantasy army, or even Warhammer 40k urban army. I tried two different techniques that I will show you here. First we need to build the press mold. 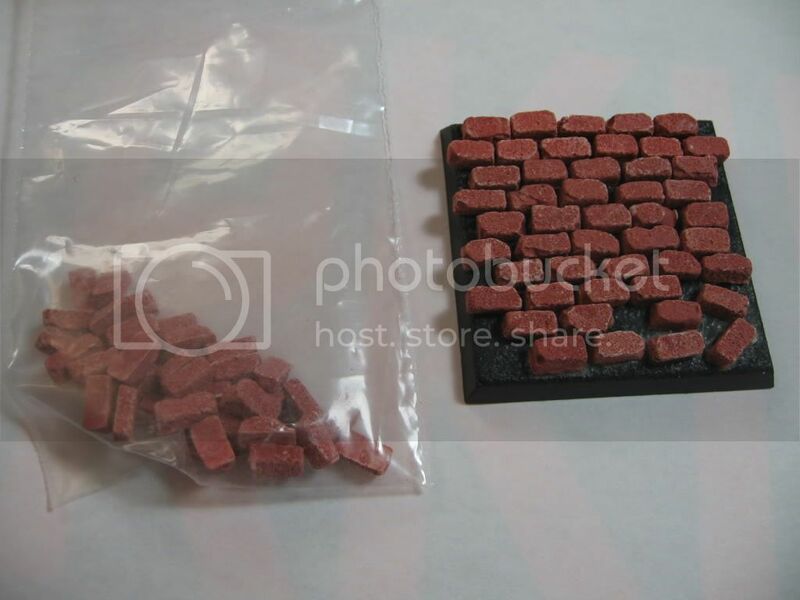 I have a small bag of little bricks I bought online. They are pretty useful for basing. Our first step is to cut a piece of plasticard or cardstock out to the size of our finished mold. I built mine about 50mm x 50mm, slightly larger than a 40mm square base. The plasticard will make the final mold a little more durable. I then made a thin layer of milliput of a uniform thickness around 5mm on top of the plasticard. Cover the top of the milliput in vaseline or chapstick (to stop the bricks from sticking as much). The next step is to make the design we will want for our brick pattern. I decided to stick with a simple pattern as I think it will show up best on a small base. You could use more complex patterns. I pushed the bricks a few millimetres into the milliput in a fairly uniform pattern. I left a few spaces where bricks have fallen out. Once this is done, leave it to set overnight. Small bricks pushed into the milliput at a uniform depth. You want it deep enough to create a good indent. The first mold I built I first glued the bricks to a 40mm base and then pressed the greenstuff on top of the dried bricks and base. This worked alright, but it was harder to control the depth of the mold. Bricks are glued onto the 40mm square base. 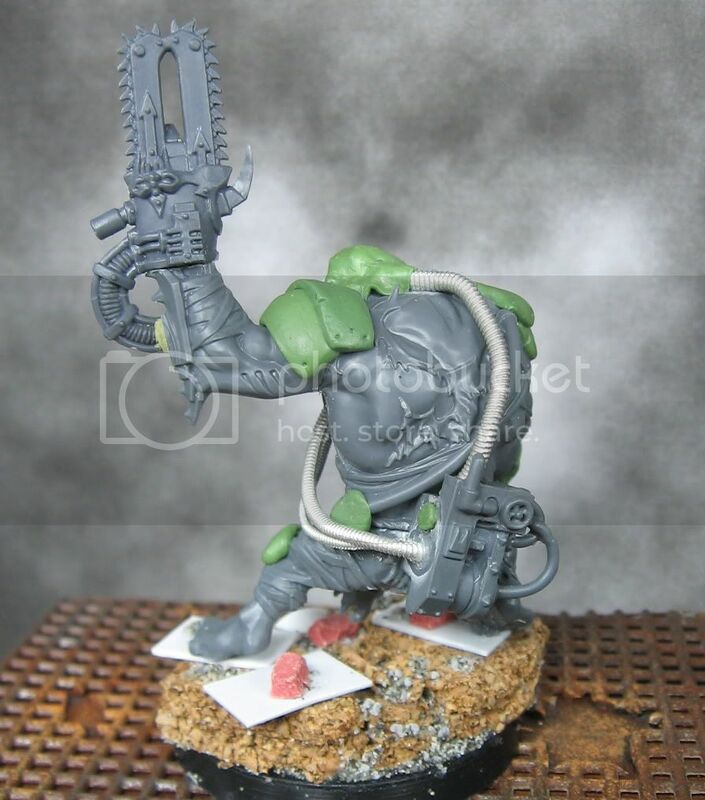 Master is pressed firmly into the greenstuff. 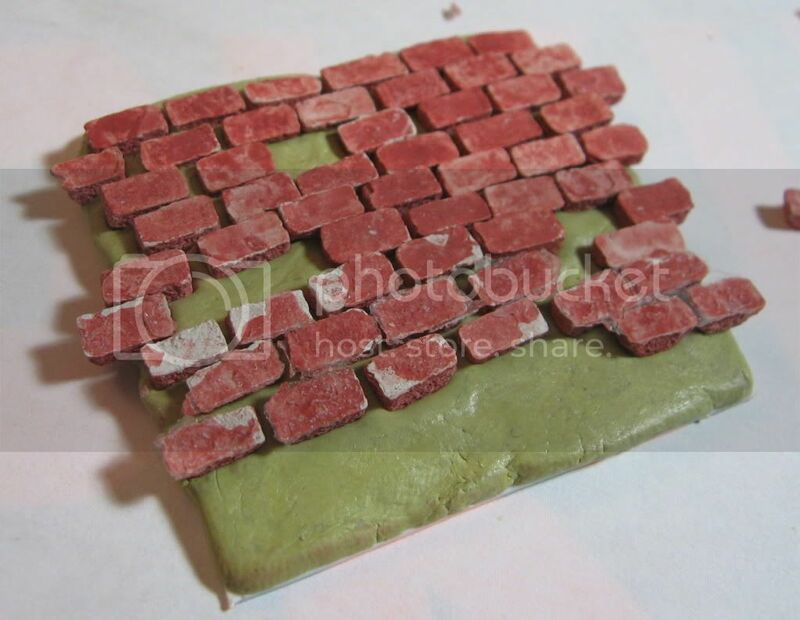 If you do not have the tiny bricks, you could still follow this tutorial by creating a master by carving bricks individually onto a 40mm base using sculpting tools, milliput and an exacto knife. Once it has set you can follow the procedure above. After setting overnight, our press mold should be ready. Carefully pop out each of the bricks. You can use a sanding block or some sandpaper to clean up the master (I tried to get mine to uniform height using a sanding block). A blurry picture of the two press molds. 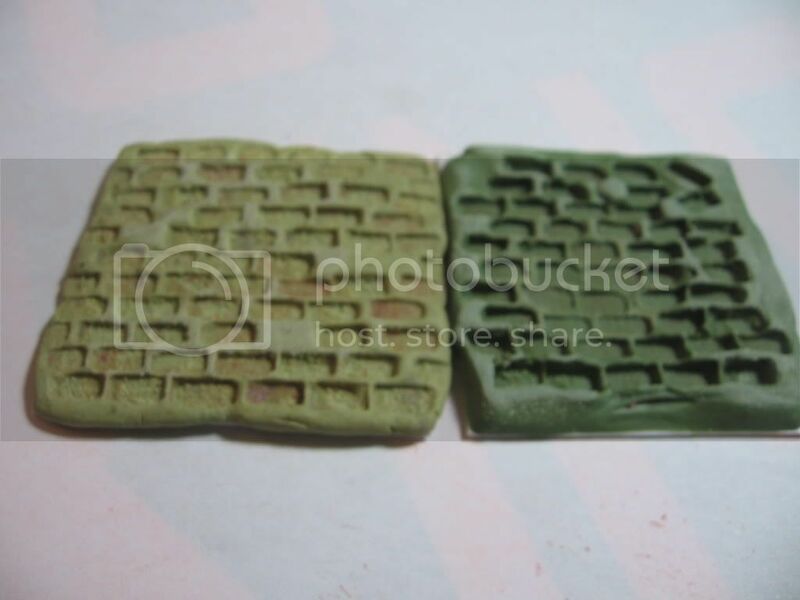 The mold on the left was made by pushing in bricks, the mold on the right was made by pushing the putty onto the master (method two). You can see the difference in depth with the two methods. Get the base you want for your final model. 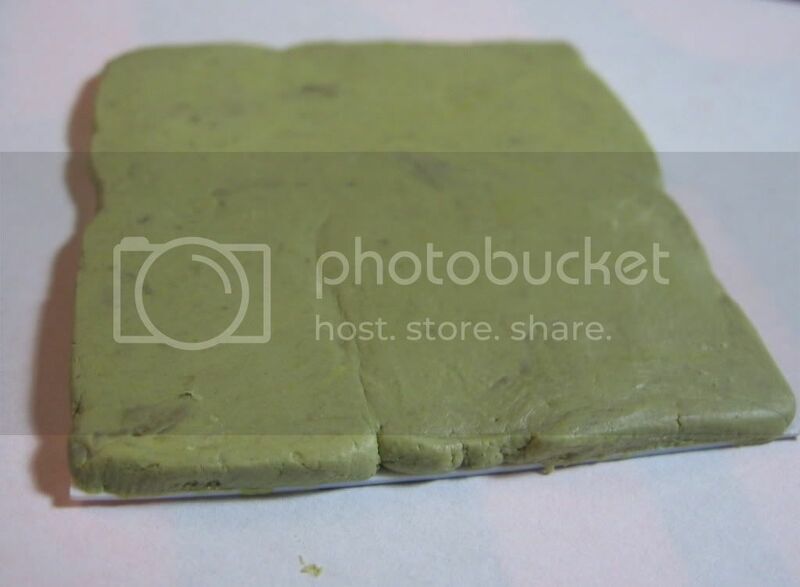 Create a thin layer of milliput or greenstuff on top of it (you could go really thin and just have the top of a brick layer of you could go thicker and have the full bricks). Put some chapstick or vaseline on top of the milliput once it is smoothed. 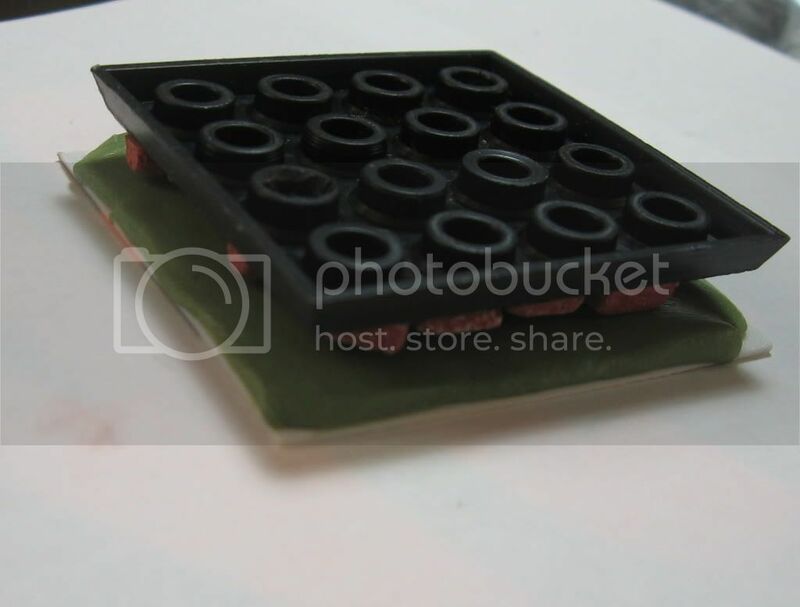 Take your press mold and push it down on top of the milliput. Push firmly so the indentations go in a few millimetres, but not so firmly that it all squishes out over the base. After pushing the mold down, carefully remove it. You should have something like what you see above. Some of the lines might not be deep enough. Using your sculpting tools or an exacto knife, carefully clean up the lines between the bricks. You can also remove damaged bricks and draw in cracks and indentations if desired. Let the milliput cure for a few hours and then add some sand and ballast in some cracks and larger damaged areas. Add any other details you want on the base. You can see here that I have cleaned up the cracks between bricks, removed some bricks, and added a little bit of sand. I would recommend using your tools to make sure the lines between bricks are on the outside edges too (I didn't do that here). You can see where I sanded the outside edge as well. After curing, your base is now ready. 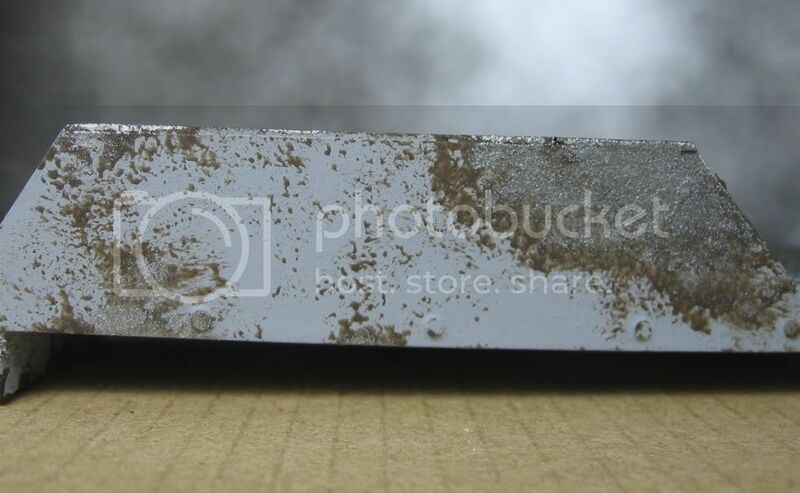 You can clean up the edges using sandpaper or a sanding block to create a smooth outside edge. You can then drill the base to pin a miniature onto. Prime the base and paint it as you would for any other model. I quickly painted mine by painting it with Americana Raw Umber and then drybrushing Codex Grey, Bleached Bone, and Skull White overtop and the dulling it down with a thinned wash of Devlan Mud. I glued on a little bit of flock with PVA glue to create some moss between the cracks. To improve the look you could paint the bricks different colours. Additional details like rubble, wood, scrap metal, etc. on top of the base will also improve the illusion. Here is the final painted base. Next time I would spend a bit more time on the painting. I think the painting is a bit bland. You can see that we have created a decent stone brick effect though. You can really enhance this by adding some static grass for moss. I used milliput for most of this tutorial. I generally dislike using straight milliput for sculpting as it tends to flake and stick a bit for me. I usually mix greenstuff and milliput. 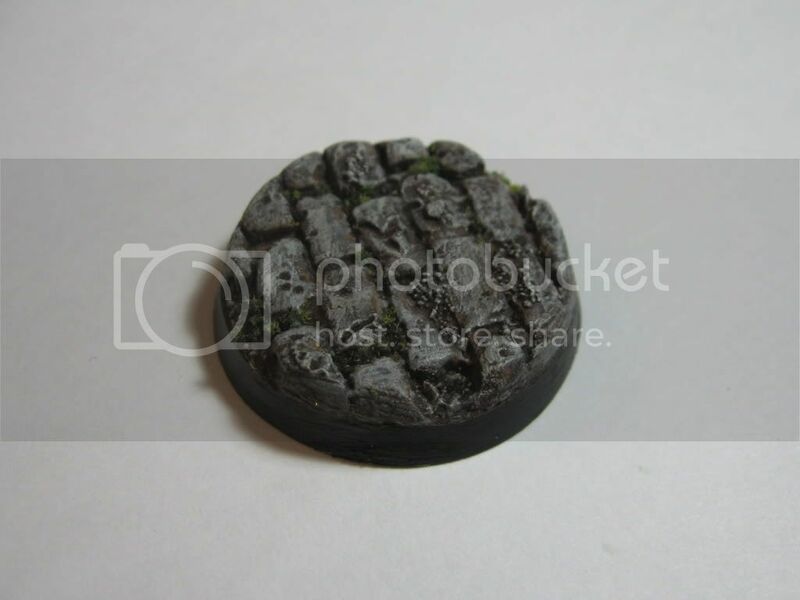 For bases like this though, milliput is much cheaper. It is also possible to sand milliput to clean up the bricks and the edge of the base. 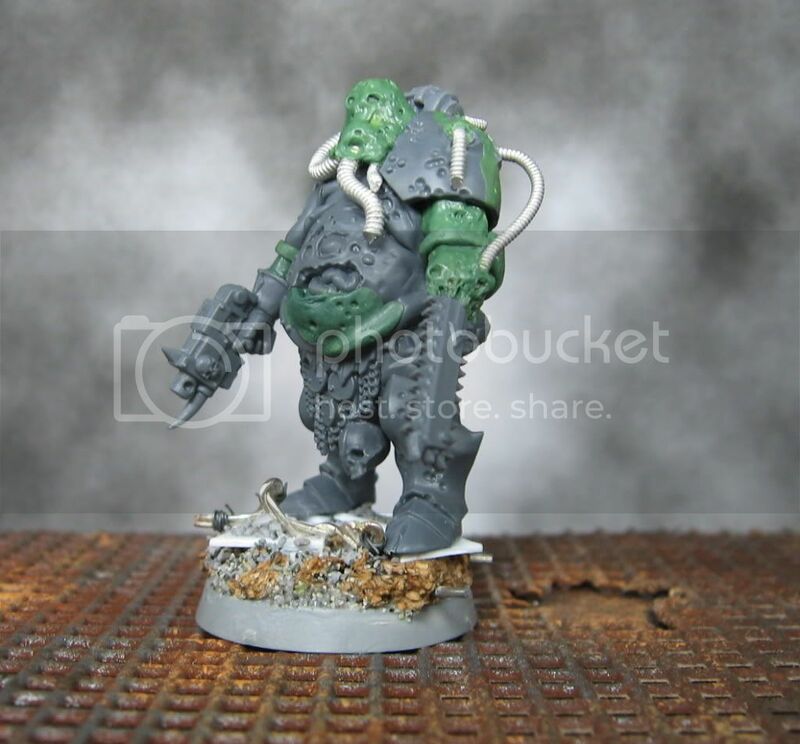 I would recommend using milliput (or something similar) over the more expensive greenstuff. Greenstuff would definitely still work though if that is all you have. 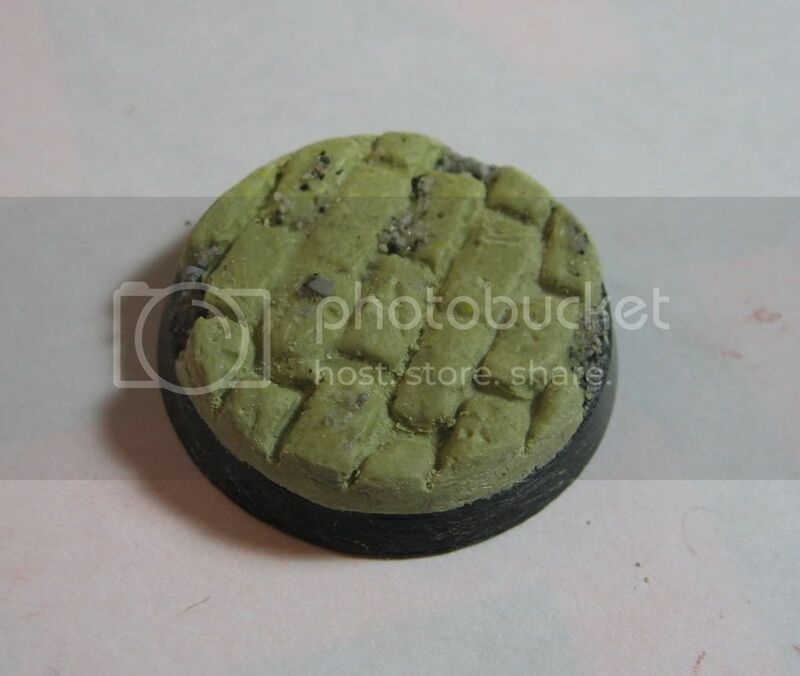 Here are some more examples using this technique for some pirate orks: Cobblestone bases. Looking for something different? Here is a tutoring on building futuristic industrial bases. I finished a few more conversions for my Imperial Renegades squad. 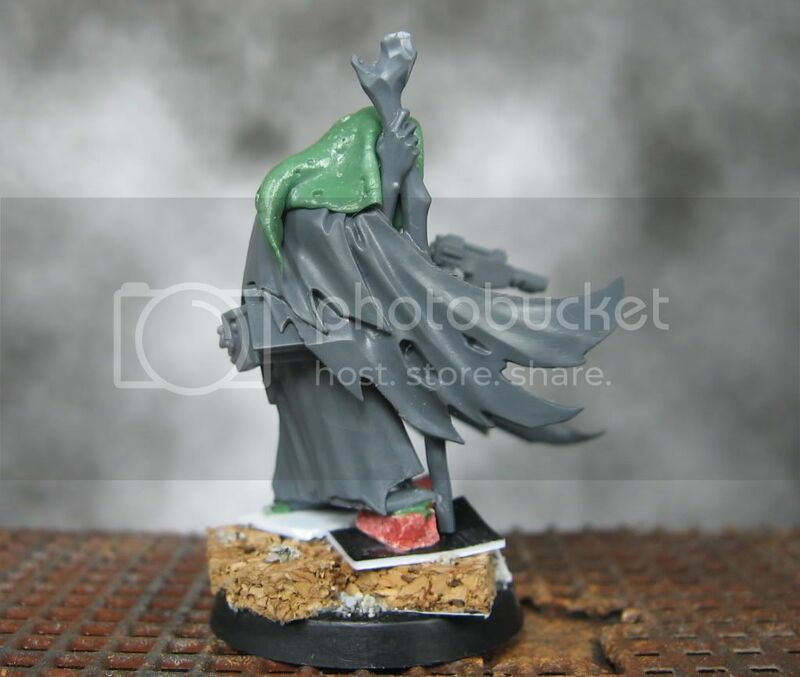 I built an apostate preacher from the plastic fantasy necromancer. I also finished the sculpting and basing on the renegade sergeant and the ogryn. Here is the converted apostate preacher. A really quick conversion. I cut off the top of the staff and carefully removed the hand with a skull (this took a while). I then added a cadian hand and put a laspistol on it. I added a cut down cadian head and then sculpted the mask and then the hood. I think he should fit in nicely with the squad while having a very distinct look. I finally got around to sculpting the left arm on this sergeant. This was my first time successfully sculpting a limb from scratch. 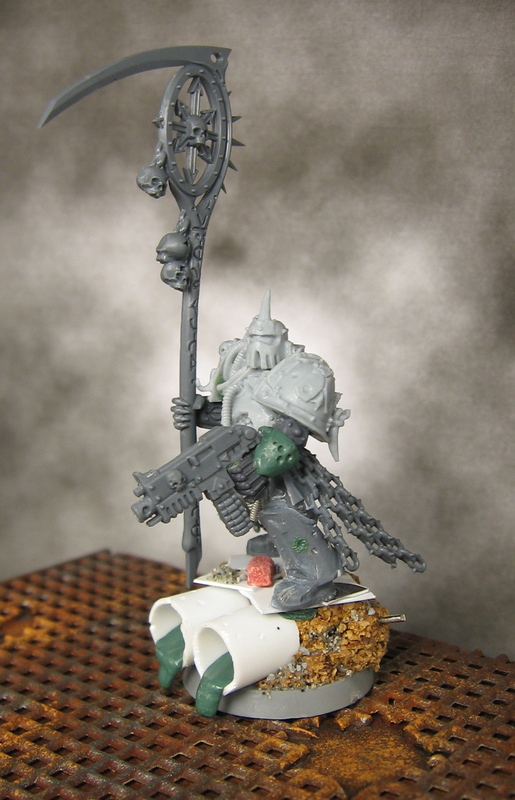 I pinned the chainsword to the torso with a paper clip and built the arm up in three layers of greenstuff. The fact he is so large and covered in sores made it much easier to convincingly sculpt it. I am excited to get some paint on this model. I am going to try and use some glazes to add bruising and grossness around the sores. We will see how it goes. 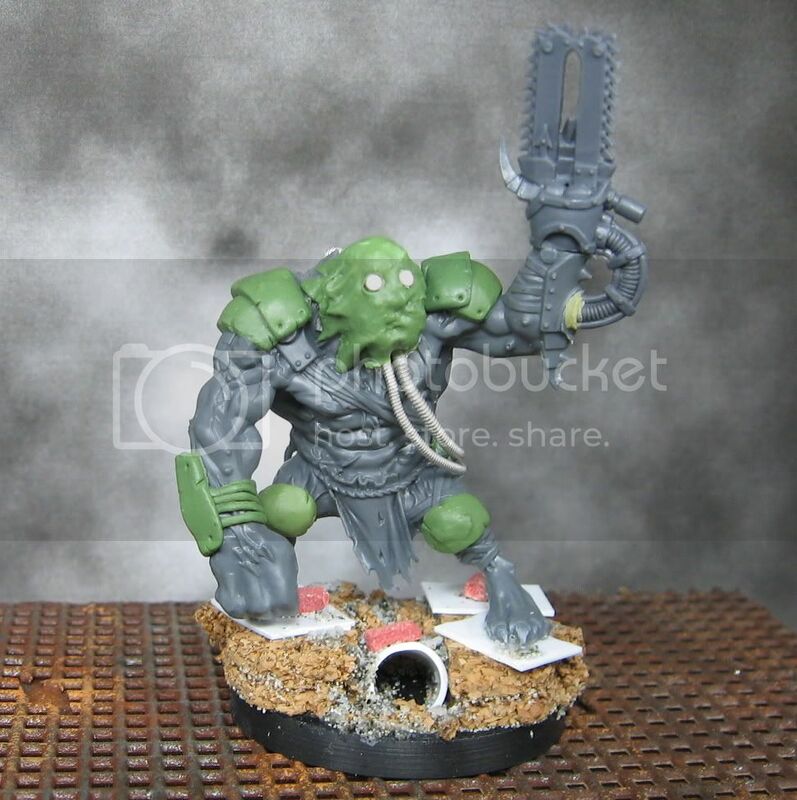 I based the ogryn. I'm not sure what stage the last pictures of him were at. I have been slowly adding armour for the last month or so. Here is a quick shot to show how big the ogryn and sergeant are. 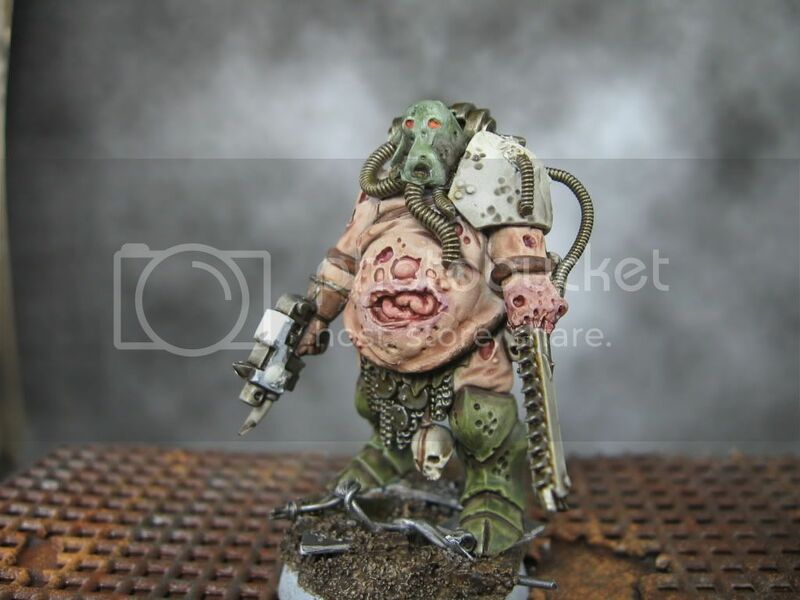 I did start to paint the deathguard model. I got a bit frustrated with trying to paint my vision so I am going to take a little break from it and paint the ogryn and sergeant next. My November goals were to paint 10 renegades (I painted 9), 7 deathguard (I painted two), and to finish my canal system. This month I will be a bit busier with work. 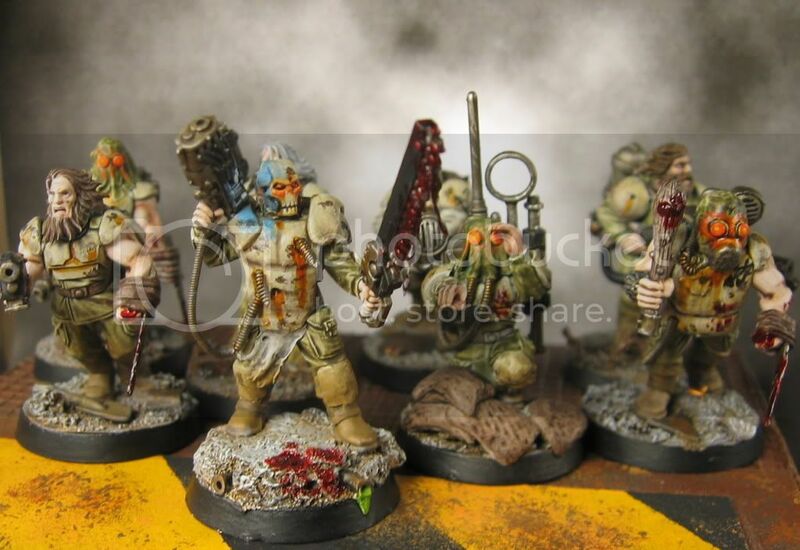 My goals are to paint 6 more renegades (commander, ogryn, sergeant, preacher, and two others), finish my death guard with scythe, finish at least six canal sections, and paint 4 of some other model (death orks of krieg, maybe malifaux minis, something). 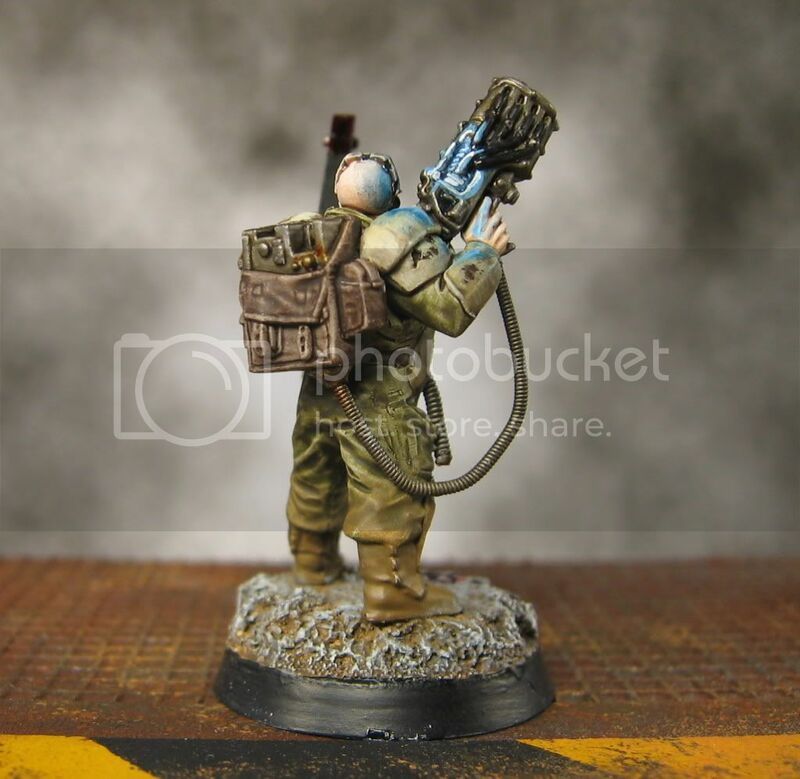 I've also updated the Servitor conversion tutorial with some finished servitors. I have some examples built along the same idea by Komfritten from the DS forums. Be sure to check them out. Thanks to everyone who has been visiting this blog and is referring others to it. This week I've hit 50 followers and 4,000 views in the three months this blog has been running. Thank you for your support. 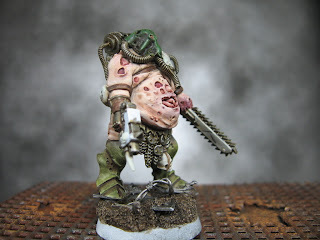 If there are things you think I should add more of to this blog, I would love to hear your input (I know I should paint more models, but that takes time!). Welcome to W40ktenerife, Lantz, and Mark Beardmore who are the newest followers. Thank you for your support! I've converted a death guard model to add to my renegades squad. 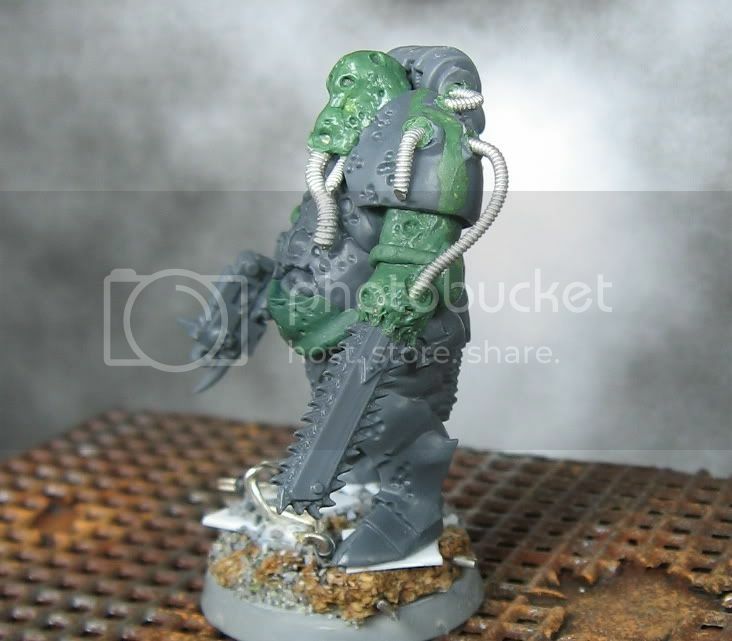 The model was built using the Forge World Death Guard torso and shoulder pads. 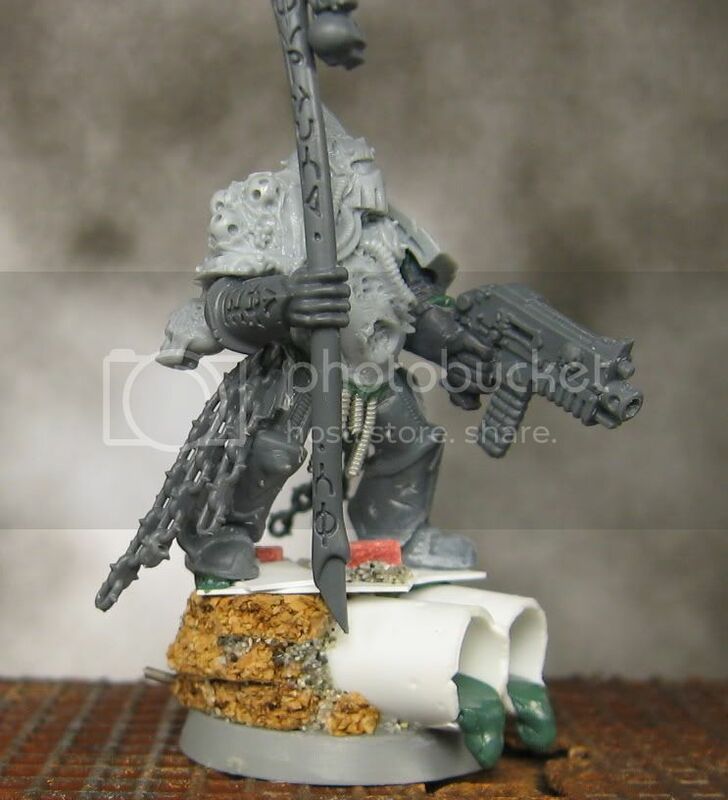 The legs, gun, and upper arms are from the chaos space marine box (and a berzerker arm too I think). The chains and scythe are from the chaos manticore lord box set. I spent some extra time on this model trying to build a dynamic base. I know people are divided on large gaming bases. I wanted to make him stand out and look like a bit of a display piece. In game terms, this should be a versatile piece. 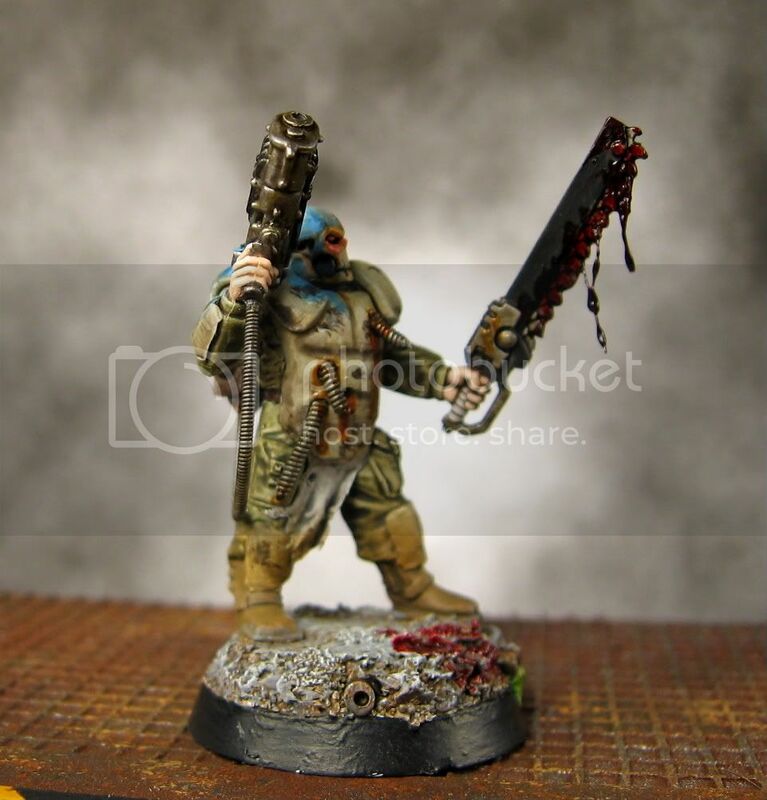 Deathsquads has the option for a chaos cultist squad lead by a space marine. I figure that this model and some new heros will allow my renegades to serve duty in two different squads. 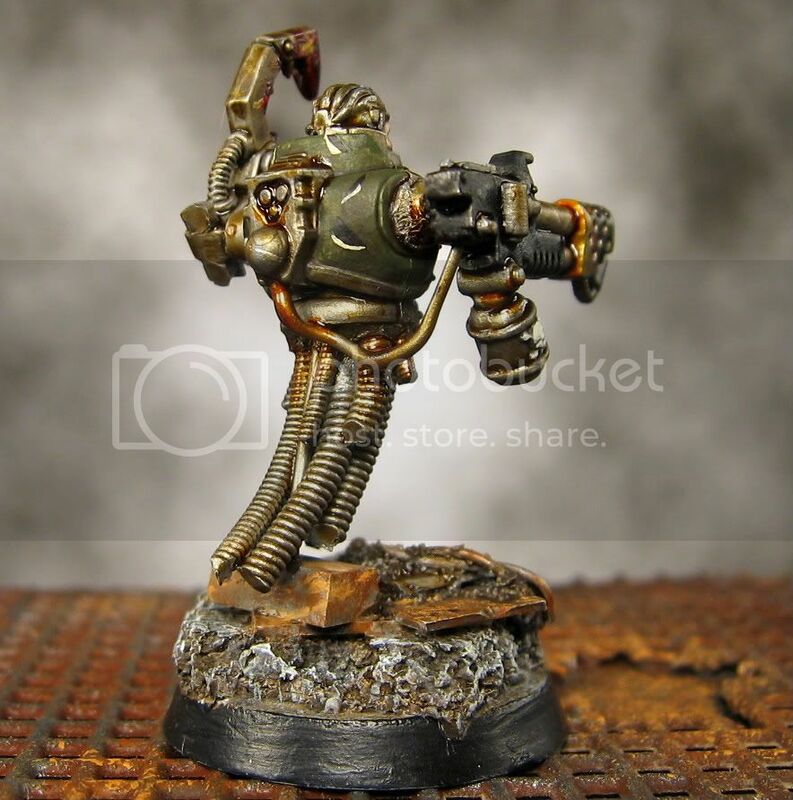 In 40k I think I can use him as a CSM lord in power armour or a sorcerer. We will see what the new Chaos Legions book brings us. 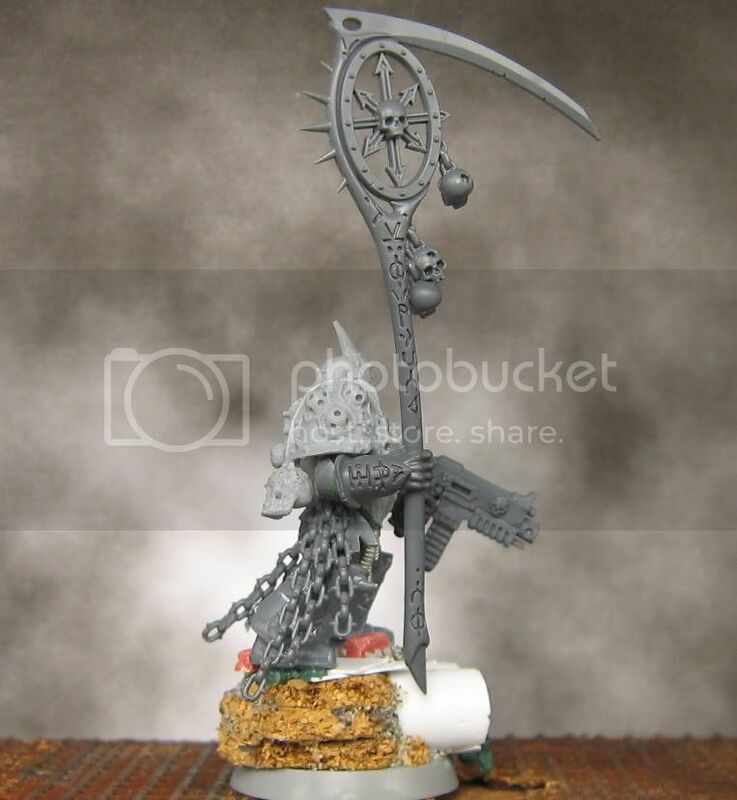 I have a sneaky feeling that daemon weapons and specific weapons like the manreaper are going to make a big comeback. I have some ideas for how I want to paint this model. I tried out an airbrush heavy technique on my other death guard test models. I think I am going to try painting this model primarily with glazes. Hopefully I will have this one finished by the end of the week. Check back later this week for some painting updates. 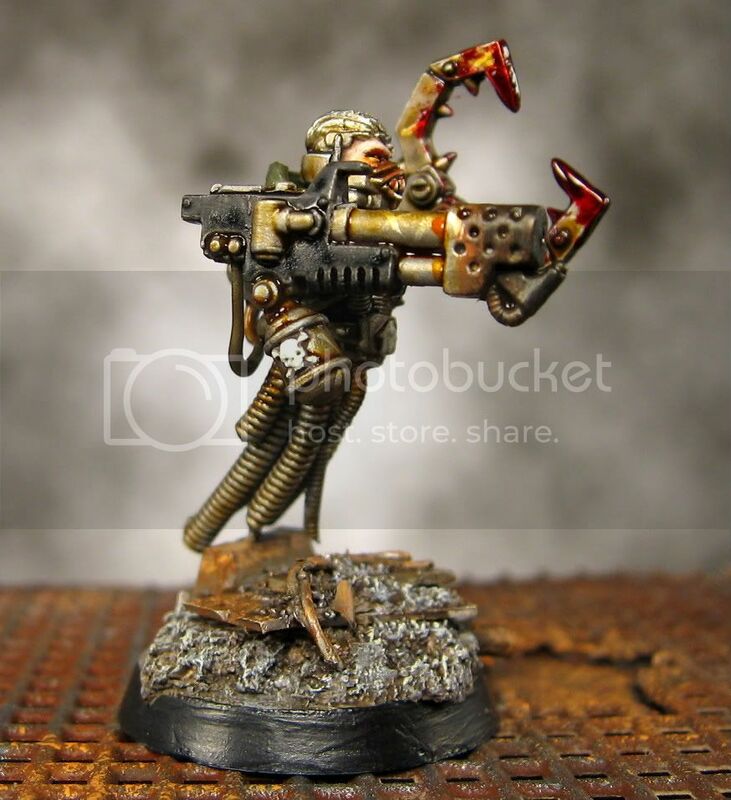 I posted a little renegade servitor conversion tutorial a few days ago. Here are pictures of the finished servitor. I've painted him to match the rest of my renegades force. I am not totally happy with the paint job, definitely not my best work, but I think the model has the right feel and atmosphere overall (grimy, old, evil). 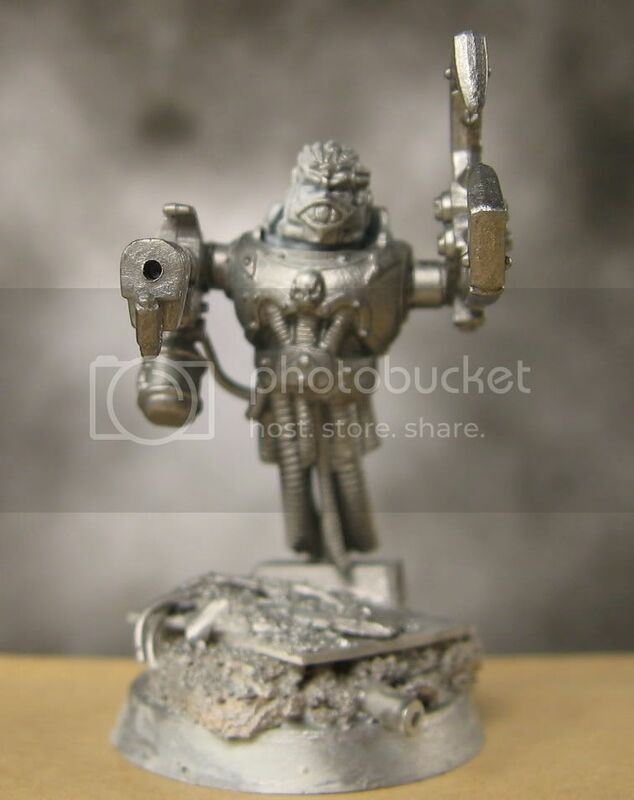 I used the airbrush to basecoat the metal parts in boltgun metal. As the model is mostly metal this was a big time saver. 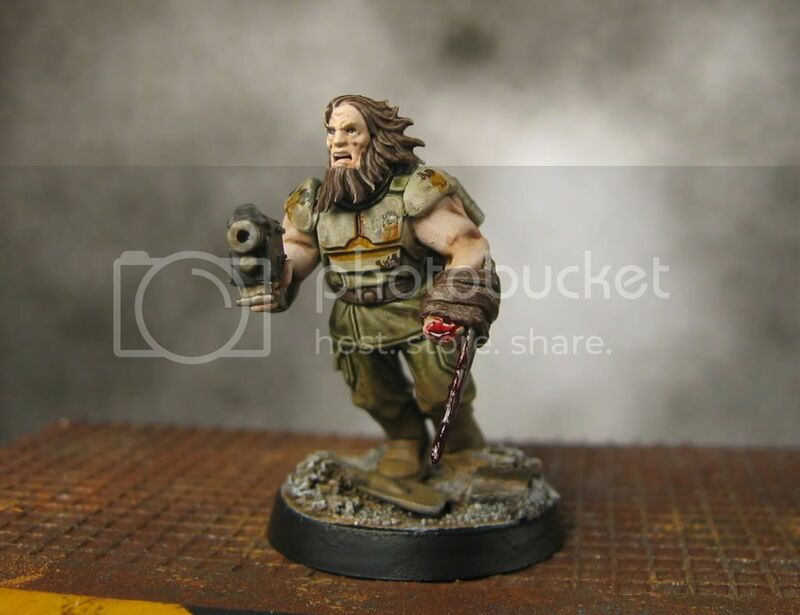 The test of the model was painted with a brush in a style similar to the rest of the chaos militia I have painted so far. You can see in this picture that I added some scratches in the armour. I'm not totally sure how I feel about them either. They do look a bit better in person though. 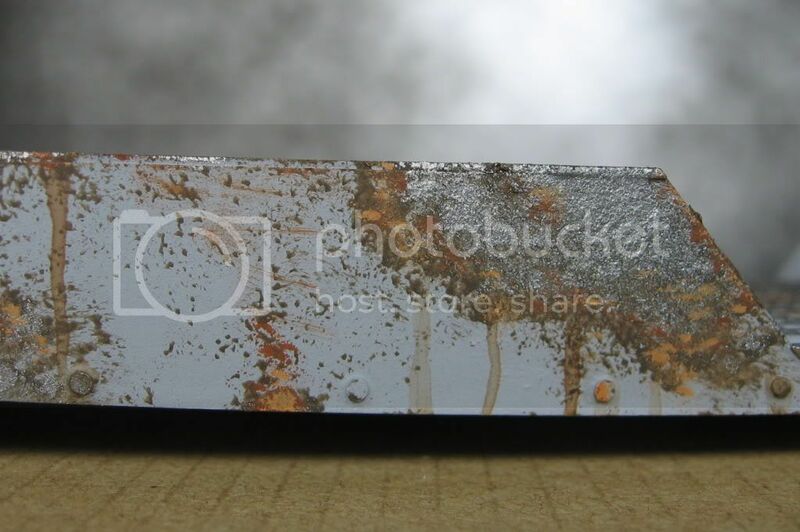 The blood was done with a mix of Tamiya Clear Red and brown paint. I also painted an objective marker that came with my order from Secret Weapon Miniatures. 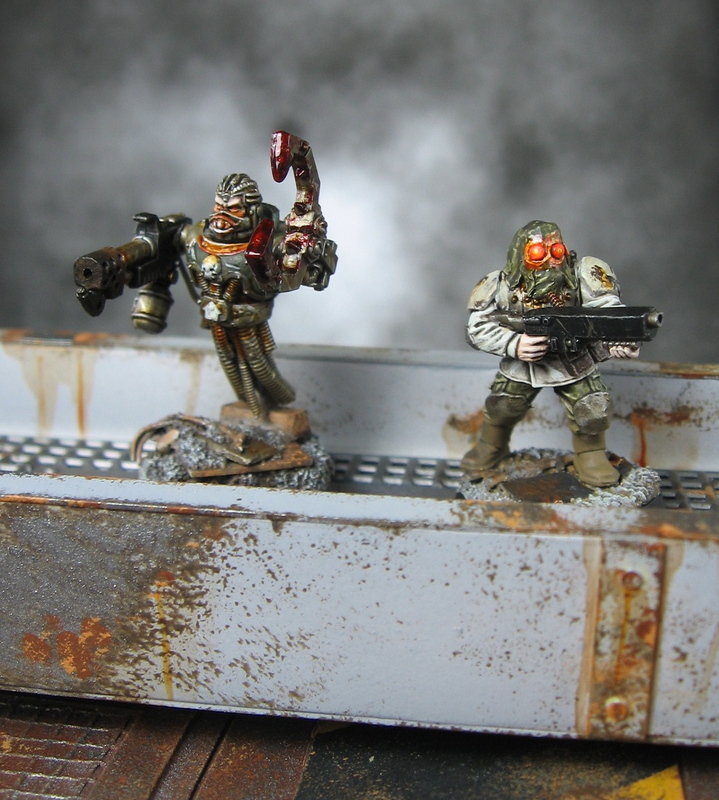 It was fun to paint and will make a great objective for my renegades. Thanks to Santa Cruz Warhammer for featuring my sergeant conversion in their honour roll this week. I really like the work they do on their blog so it is an honour to receive a mention from them. 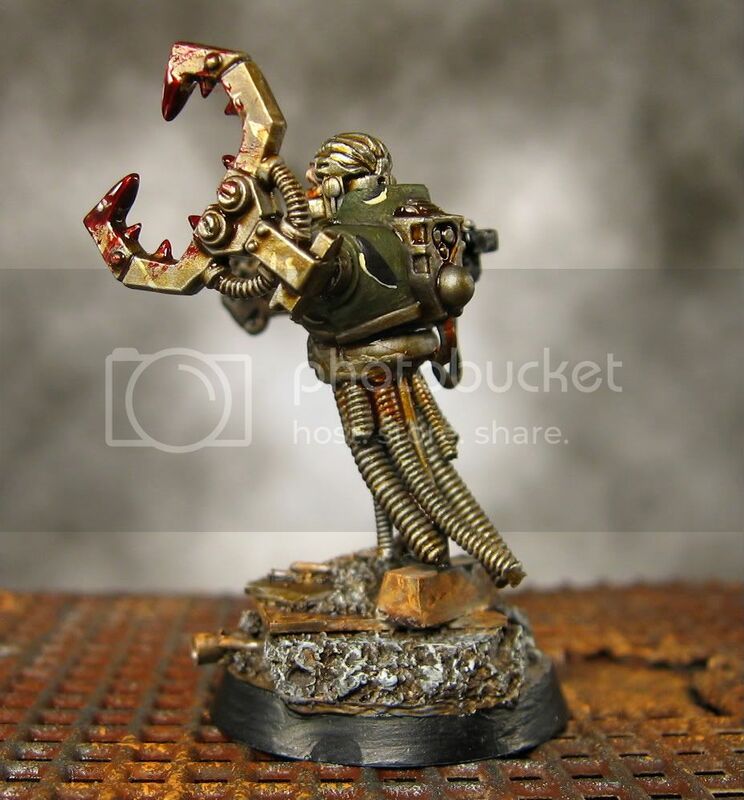 Welcome to new followers Grim Darkness, Mordian 7th, and Old School Terminator. Speaking of Santa Cruz Warhammer, they featured the Blood Ravens Army Project on their blog today. This project is building a blood ravens army and raffling it off/collecting donations to raise money for Child's Play. I've added a badge to the top that will be there until the project concludes. Check it out. Be sure to check back soon. 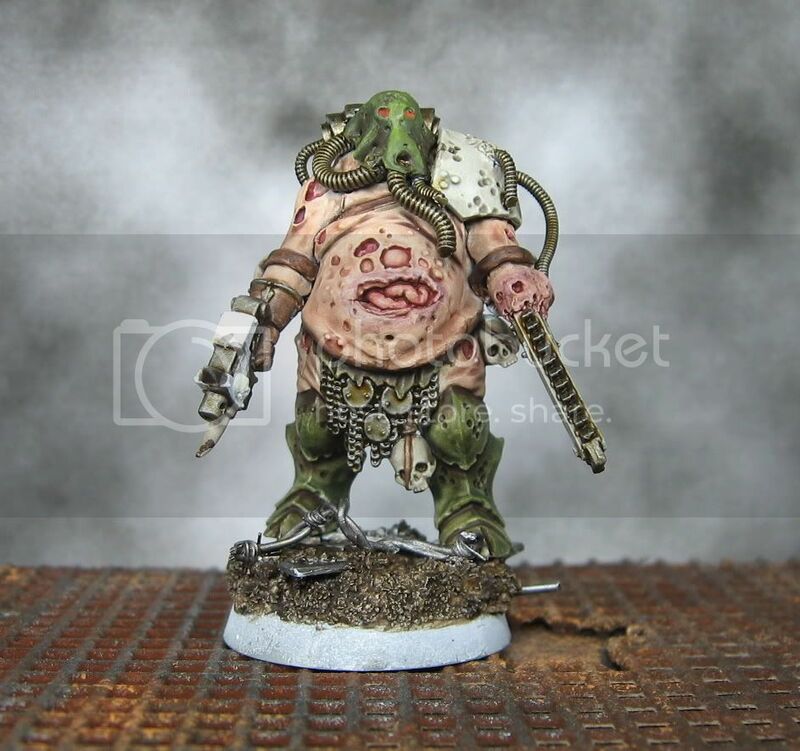 I have some pictures of a death guard conversion going up tomorrow. Later on this week I hope to have some finished canal sections and some painted models to share with you. Thanks for visiting. I've managed to complete four more imperial renegades this week. I now have a total of eight chaos militia finished for my squad. 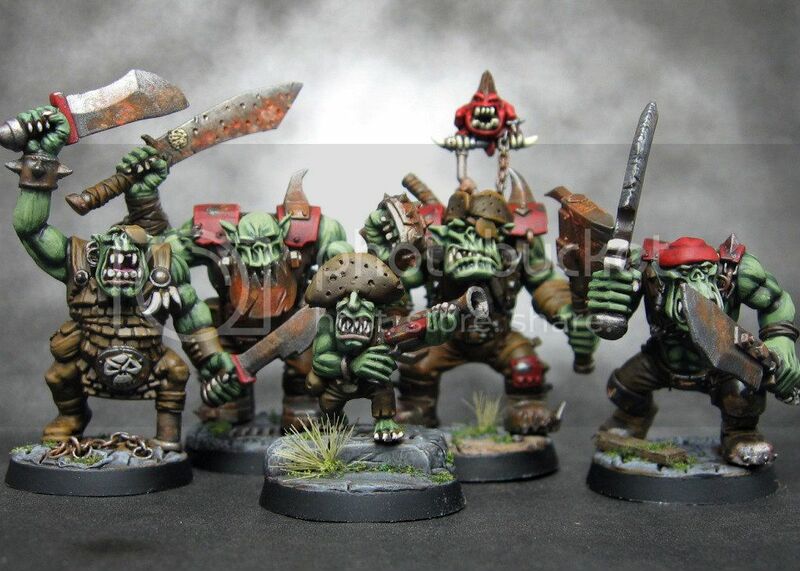 Here is a picture of the models completed this week. Enforcer is the models with the glowing gun and skull helmet. The strings of blood were made by supergluing short pieces of hair to the chainsword and then layering the blood over it. It is a bit gruesome. This was my first attempt at painted flowing weapons with object source lighting. I painted the eyes to glow a little bit more brightly this time. You can also see some spent shell casings on the base. 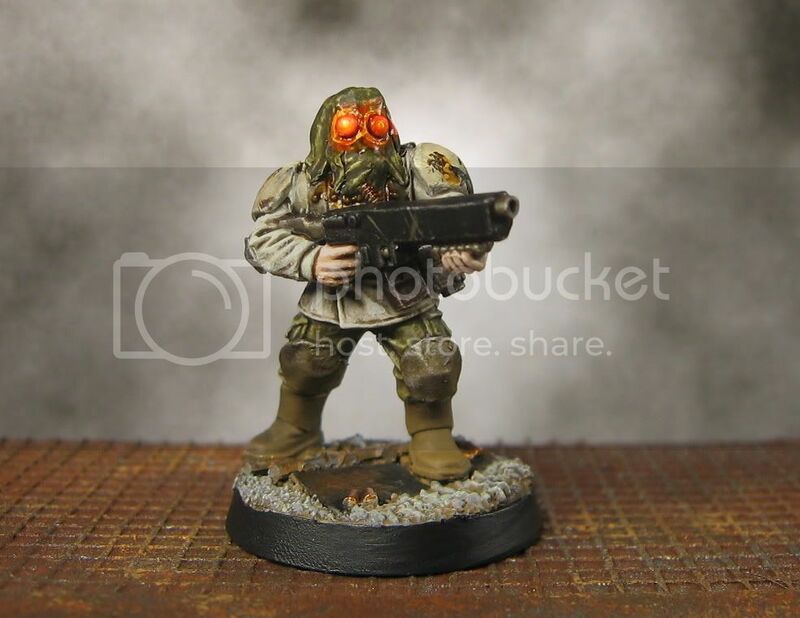 Traitor guardsman with pistol and close combat weapon. I painted the skin with Reaper Master Series pale skin triad. Finally, a picture of the gang so far. Don't worry, I painted the eyes in this time and touched them up on the old models! As always, thanks for visiting. Comments, tips, and suggestions are always appreciated.